saranye trayambake gouri narayani namo’stu te. During Navaratri ("nine nights"), the Lord in the form of the Mother Goddess is worshipped in Her various forms as Durga, Lakshmi and Saraswati. Though the Goddess is one, She is represented and worshipped in three different aspects. On the first three nights of the festival, Durga is worshipped to gain noble virtues, all evil tendencies in the mind must be destroyed. This destruction is represented by the Goddess Durga. Lakshmi , for knowledge to dawn within us, we have to prepare our minds. The mind must be pure, concentrated, and single-pointed; this purification of the mind is obtained through the worship of Lakshmi Devi. And then Saraswati Devi on the last three nights for Victory over the mind can be gained only through knowledge, through understanding; and it is Goddess Saraswati who represents this highest knowledge of the Self. 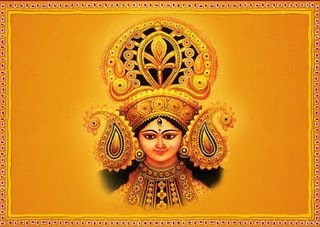 The following tenth day is called Vijayadasami. Vijaya means "victory", the victory over our own minds that can come only when we have worshipped these three: Durga, Lakshmi, and Saraswati. Bhagavati, Bhavani, TripuraSundari-MahaDevi are some names of Maa-Nava-Durga. Thus, at Navaratri, Goddess Durga is invoked first to remove impurities from the mind. The Goddess Lakshmi is invoked to cultivate the noble values and qualities. Finally, Saraswati is invoked for gaining the highest knowledge of the Self. This is the significance of the three sets of three nights when all these three are gained subjectively, and then there will be Vijayadasami, the day of true victory! The sum total of all energies put together comprises “shakti”. This Shakti energy or transcendental energy is kriya, karma, and dharma. “Maa” is the first sound of the personified name of the kriya, karma and dharma. “Uma” is the nitya “Durga” whose nine forms are the referred to as “Nava-Durga”. Nava-ratri literally means nine nights. During the spring, we call it Raama-Navaratri [associated with the victory of Raama over Ravana]; and, in autumn, it is known as Durga_Navaratri. The earlier is associated with Ramayana epic and the later is associated with the puranas, Vedic shastras, and ancient Devi-worship by the trinity of Hindu_Vedic Gods Brahma-Vishnoo-Mahesh. The universal cosmic energy also known as Divine Maa Maha Kali is elucidated in Devi sukta of the Rig Veda Samhita, as well as Kena Upanishads. Adi-shakti [supreme cosmic energy] is beyond the human comprehension and beyond the conceptualisation. b. As embodiment of female beauty and the exciter of desire. Many Text describe Devi extraordinar beauty saundaryalahari : one of the famous hymn praising the Devi. Lalitha-Sahasranama : Ramya (the beautiful one), Kanta ( loveliness ), Vamanayana ( she who have beautiful eyes ), Ratirupa ( she whose form is Rati ). c. As the source of food and nourishment. She is often associated with earth itself Lalitha-Sahasranama : Annanda ( she who gives food ), Pusti (she who gives nourishment ), Satakasi ( she who has on hundred eyes ), Sakambhari ( she who bestows vegetables ), Annapurna ( she who is full of food ), Jagaddhatri ( she who supports the world or another ). TO maintain cosmic order Devi often takes in fierce form when she enters into battle. As guardian of the Cosmos, she appears in a form of a great warrior, battling against Demons on behalf of the gods. Other aspects of Devi are often described in three concepts namely : SHAKTI, MAYA and PRAKRUTI. Great Goddess who is the abode of all blessings. To She who is the primordial energy of the cosmos and the sustaining principle we offer adorations with deepest devotion. Salutations, to the Goddess who is the shakti of Bhagavan Vishnoo. Maha-Devi has been booned sixty four forms, sixty four chakras, sixty four mantras, sixty four yantras, sixty four tantras of the moon, sixty four shaktis, sixty four energies and sixty four divine trances of higher order. Such is the glory of Maa per all Vedic scriptures.